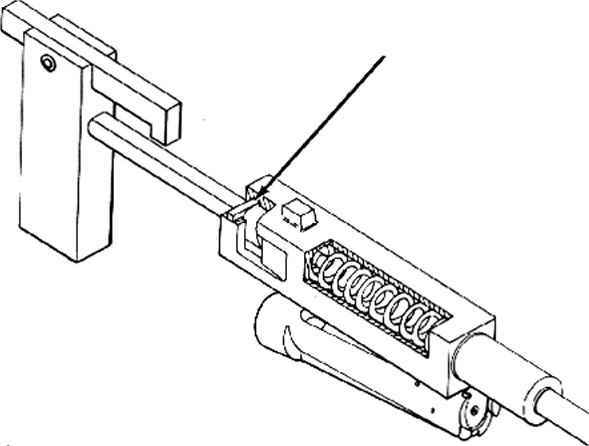 The cycle of operation starts with a cartridge in the chamber and with the bolt locked to the barrel (fig. 3-6A). When the cartridge is fired, the pressure of the powder gases drives the projectile and gases forward through the bore and at the same time drives the entire gun mechanism to the rear in recoil. During the action of the powder gas pressure, the retardation offered by the barrel spring is relatively small so that the only really significant factor in limiting the recoil acceleration is the mass of the recoiling parts.